Dineo is a Masters student in Public Health at the University of Cape Town. She holds a degree in Medical Bioscience and an honours degree in Medical Biochemistry from the University of Leicester. She is an avid volunteer who spends her free time helping Gracepoint Church in Youth and Children's Ministries and issues of Compassion and Justice. She is passionate about community development and social issues. 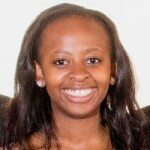 Dineo has a passion for people and hopes to make a meaningful impact in their lives through improved health care, focusing primarily on South Africa.